Thailand’s property market may enjoy a 10 per cent growth this year, an expansion by 120,000 housing units, according to the Government Housing Bank (GHB). Samma Kitsin, director of the GHB Real Estate Information Centre, said there were 32,000 newly-built housing units in the first three quarters of the year and the figure will rise to 40,000 units by year-end. There were 60,000 units of new condominiums in the first three quarters with a forecast of 80,000 units this year, representing a 20 per cent growth with an emphasis on projects along mass transit train routes, he said. Higher land prices have led more consumers to buy condominiums instead of homes in housing estates, he said. Loan extensions by commercial banks have significantly slowed down in the second half of the year after 20-25 per cent of loan applications were rejected – much higher than the normal 10-20 per cent rejection rate. Commercial banks have achieved their loan extension targets while many financial institutes were concerned with the continued economic slump, he said. 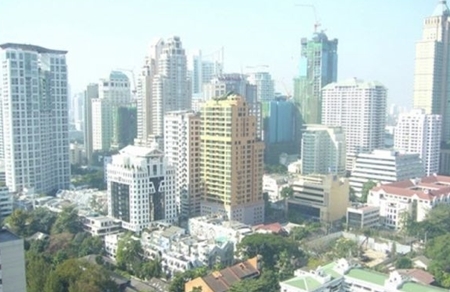 Among positive factors contributing to the real estate business are reduced personal income taxes which consequently boost consumers’ purchasing power and higher housing demand among foreign investors who choose Thailand as their regional manufacturing base in preparation for the ASEAN Economic Community in 2015. The combined value of 40,000 new units of housing estates and 60,000 condominium units is estimated at Bt400 billion while prices will increase by 5-10 per cent, he said.